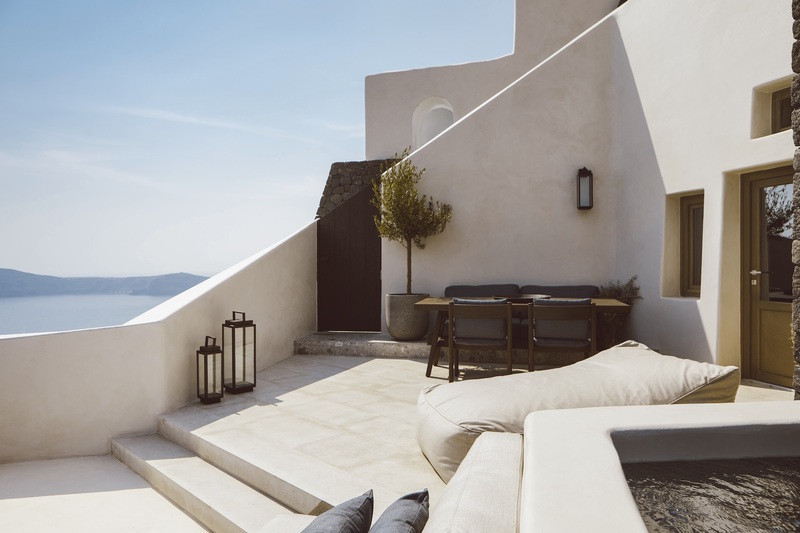 Set in the north of Santorini, Vora is celebrating minimalistic Cycladic design. Many locales purport to be the most beautiful spot on earth, and Santorini—with its sun-bleached houses, blue-domed churches, and breathtaking views—can certainly throw its hat in for the title. And there is no better perch from which to appreciate the sublime natural splendour of the island than at Vora, which has been painstakingly carved into the cliff face of Santorini’s caldera. 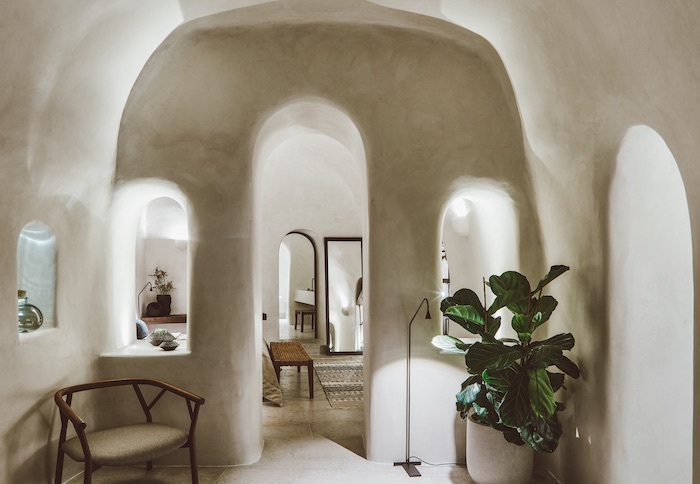 Hand-built over a period of four years—the position of the site made it inaccessible to construction machinery—Vora’s three private villa accommodations are a lesson in minimalistic Cycladic design, defined by a chic neutral palette that is augmented by dark brown wood. A private plunge pool with each villa completes a picture that seems as impossible to create as it is perfect to experience. Taking up the mantle from Kapsimalis Architect, progressive Athens-based design firm K-Studio were tasked with taking a seemingly inhospitable vertical landscape and crafting one-and two-story dwellings from its steep cliff face. Local press-cement construction techniques allowed for the stacking of the villas, which are rendered in white cement and dark stone to harmonize with Santorini’s distinct architectural landscape. 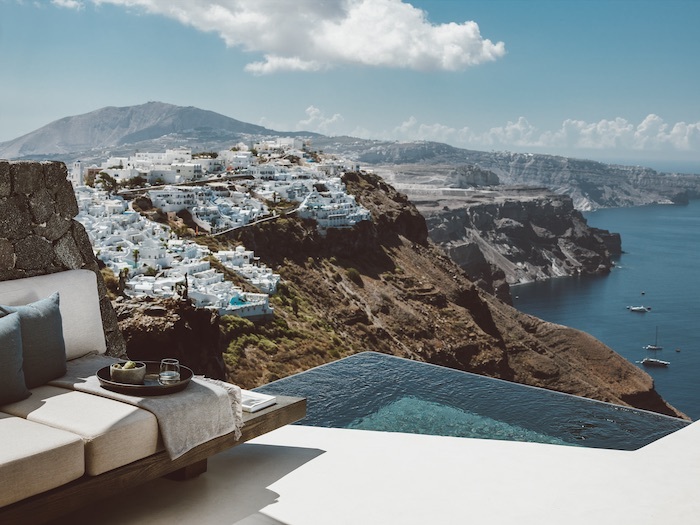 Clean angles, strategic stairwells, and private terraces with equally sequestered pools set the scene, which provides a soothing contrast to the dramatic, craggy edges of the hotel’s cliffside location. Ensuring that the hotel’s striking setting remains centre stage, the design concept at Vora has been conceived to frame and complement the awe-inspiring vistas. 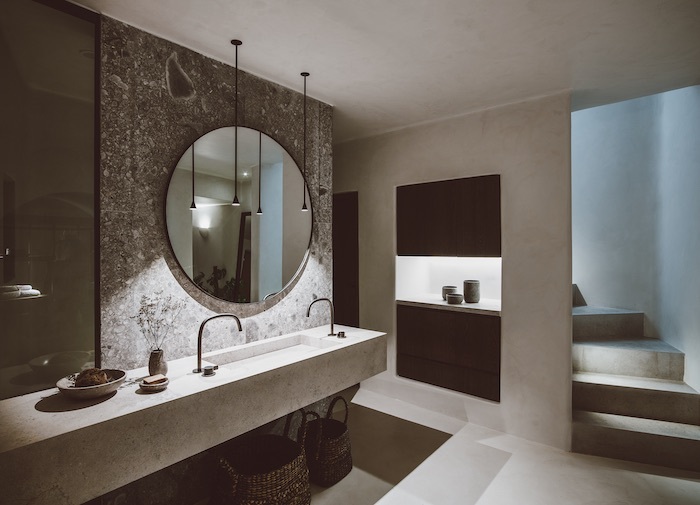 The minimal yet ultra-luxurious interiors are defined by an earthy colour palette of beige, dark wood, and black, and feature a series of charming arches throughout, paying homage to the local architecture. A mix of custom-made furniture by neighbouring craftspeople and K-Studio, as well as local materials such as black volcanic rock and vasculitis marble, give the spaces their unique stamp.